Image: The Kingston Flyer, from Wikipedia. 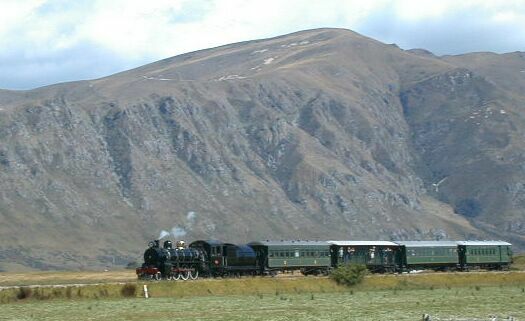 My friend Bill Ellis informed me last Sunday that there is a way of telling South Island steam trains from those in the North Island -- the Southern ones have white rims on the wheels of the locomotive. That was definitely an "are you serious?" moment, but he was, and he's right. Check out the Kingston Flyer above. Three Invercargill men in their early 20s were arrested for trying to get a closer look at the Kingston Flyer about 7.10pm on Saturday night. The men climbed a fence and climbed aboard the historic steam train. The men were charged with being unlawfully in a private property. Like whitewall tyres those rims look very sophisticated and just right. I agree. I'm not sure why there was that difference between North and South yet, but hopefully someone may come along with an explanation.